If you are facing criminal charges in Casper, Wyoming (a part of Natrona County), you need a Wyoming criminal defense attorney familiar with the local court's procedures. Our legal team has the experience to represent you in Casper's district, circuit, and municipal courts. With the city's international airport, Casper Community College, Casper, Wyoming courthouses see a lot of out-of-town visitors. Tourists and college students alike can find themselves facing DUI / DWUI charges downtown. Residents, students, and visitors facing criminal charges all need a lawyer familiar with the local courts and their staff. 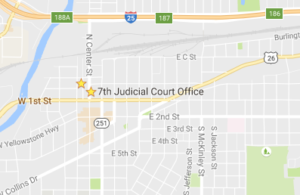 The 7th Judicial District Court is located at 115 North Center Street, Suite 100, Casper, WY, 82601. Three District Court judges hear cases here: the Honorable W. Thomas Sullins (through January 2021); the Honorable Dan Forgey (through January 2021); and the Honorable Catherine E. Wilking (through January 2019). The District Court handles felony criminal cases after the matter is bound over by a preliminary hearing. An arraignment will be held for the plea of guilty or not guilty to the charge or charges. If a plea of not guilty is made, the court will set the matter for a motion hearing and/or a trial. The judges may also revisit bond issues if a motion is made by the prosecutor or the criminal defense attorney. The Natrona County Circuit Court shares its courthouse with the 4th Judicial District Court, but it is located in Suite 400. Three judges are appointed to hear circuit court cases here: the Honorable H. Steven Brown (through January 2017); the Honorable Michael N. Patchen (through January 2019); and the Honorable Brian D. Christensen (through January 2017). These judges hear misdemeanor criminal cases from beginning to end, and the preliminary hearings in felony cases (before they get sent to the District Court). This court also handles family violence, stalking, sexual assault, forcible entry, and detainer charges. The City of Casper Municipal Court is located on the Fifth Floor of the Hall of Justice, at 201 North David, Casper, WY, 82601, one block west of Center Street. This court handles all Casper City ordinance violations, (with penalties of up to 6 months in jail and/or $750.00) as well as all city parking and traffic violations. If you have a case in Casper, you may also need to know that the Natrona County Clerk is located at 200 N Center St, Casper, WY 82601. Criminal defense lawyer Christina L. Williams appears frequently before the Natrona county courts in Casper. The staff there know her, and she has developed a reputation with District Attorney, Michael A. Blonigen, and Natrona County Attorney William A. Knight's office. She knows what to do to get you a fair outcome before these judges. With her at our head, Just Criminal Law legal team will work hard to develop your case, and get you your day in court. Our skilled criminal defense team is ready to take your case in Casper, Wyoming. It is never to early to get our team on your case. Even if you are just now being investigated by local police, we can help protect your rights and prepare a strong defense. Call 307-686-6556 or contact us online to schedule your personalized case review and strategy session.